Apparently, Black Friday came and went a week ago. That is unless you’re an Exeter Chiefs supporter, who was left with that gloomy feeling after their side slipped to their first Gallagher Premiership defeat of the season away to Harlequins. Unbeaten after eight rounds of battle and sitting top of the pile with 38 points in the bag, Rob Baxter’s high-flyers suffered a rare case of capital punishment as their London-based hosts claimed maximum reward for a hard night’s work at the office. Tries from James Chisholm, Nathan Earle (2) and Joe Marchant paved the way for victory for Paul Gustard’s side, whose remaining points came courtesy of the boots of James Lang and Marcus Smith. In reply, the Chiefs countered with four scores of their own through Matt Kvesic, Jack Yeandle, Ollie Devoto and Ian Whitten to ensure they at least claimed two bonus points for their efforts.However, it merely covered up a disappointing night for the Devonians, who were far from their slick best at The Stoop. Although Baxter had his international stars back in harness after their duties during the Autumn period, the Chiefs leader opted to give all of them the week off, looking at the long-term picture, rather than the here and now. It meant the Chiefs arrived in the capital with an unchanged pack of forwards, whilst behind there were starts for Joe Simmonds, Sam Hill and Tom O’Flaherty, the latter making his first-ever Premiership start. Harlequins, meanwhile, welcomed back England prop Kyle Sinckler in their front-row, while Ben Glynn was a last-minute call-up at lock after Matt Symons failed a fitness test.Behind, Gabriel Ibitoye helped inject some speed on the wing as the Londoners looked to bounce back from their defeat at Worcester Warriors last time out. The return of Sinckler was a welcome boost for Paul Gustard’s side and the tight-head helped to glean the penalty from which the home side took a seventh minute lead.Under pressure, it was Moray Low adjudged to have dropped a scrum, gifting Lang the chance to fire his side in front with a penalty. It was no more than Harlequins deserved after a lively opening ten minutes, but when they conceded a penalty midway inside their own half, it allowed Simmonds to kick to the corner and position the Chiefs use five metres from the home try-line. Exeter went off the top with the line-out, Hill thrusting his way towards the whitewash only to be denied.In their attempts to halt the Chiefs centre, Quins strayed offside and the visitors had another go. A second penalty followed, quickly followed by a third which - on this occasion - Baxter’s side ruthlessly put away. Don Armand took the ball at the front of the line-out, his fellow forwards packed around him and when the drive came on, it was Kvesic who was credited with the final touchdown. Sadly, Simmonds’ conversion attempt cannoned back off the near post. Minutes later and the Chiefs threatened again, Cuthbert latching onto a loose Sinckler pass before hacking the ball forward and gathering up possession impressively. However, as his team-mates raced to support him, it was Hill who was pulled up by referee Ian Tempest for a neck roll, chalking off a great attacking opportunity for the Devonians. Harlequins made the most of the let-off and having positioned themselves back down field, it was their turn to pounce when they struck from a five-metre line-out.A smart move from the home side saw them expose a gap at the front of the set-piece, where skipper Chisholm was able to power through the Exeter defensive line to score. Then, as half time approached, Quins added a crucial second try.Danny Care and Francis Saili linked well to released full-back Mike Brown, the England full-back drew in the cover before feeding Earle, who produced a quality finish in the left-hand corner. Thankfully for the Chiefs, Lang was again unable to convert, his testing effort from the touchline cannoning back off the left post. 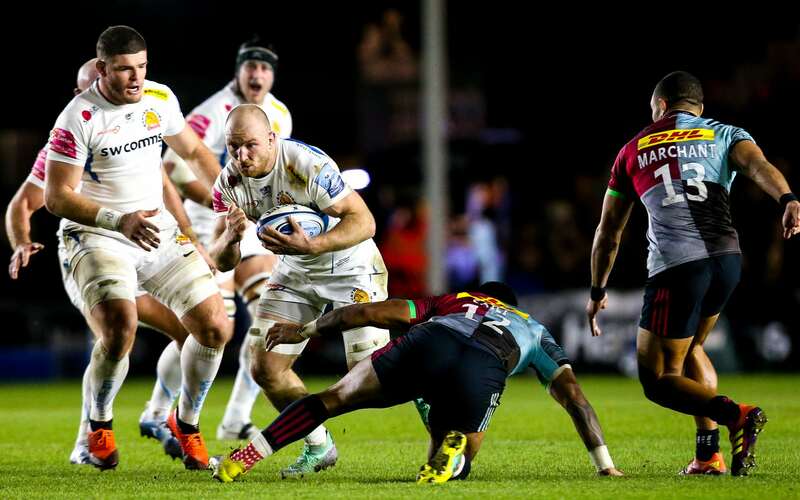 With work clearly to do, the Chiefs started the second half brightly, setting up camp within the Harlequins 22 with a number of early penalties.Having threatened twice, again there was to be no mistake when they were afforded a third attempt. Armand was again the gather of the set-piece and, just as they did in the first half, the Chiefs pack merged as one to propel skipper Yeandle over for the score, which this time the boot of Simmonds was able to add the extras to. Seemingly back in the mix, now was the opportunity for the Chiefs to flex their muscles in all departments.Having done it numerous times this season during their unbeaten run in the top-flight, the stage was set for Baxter’s charges to blow their rivals away in the final quarter. Harlequins, however, had other ideas and having threatened deep inside the Exeter 22 with a prolonged attack, only to be turned over by some great work from Alex Cuthbert, it was off a poor clearance from Nic White that the home side were able to add a third score. Patient build-up played, conducted at a decent tempo from the masterful Danny Care, saw the England scrum-half edge his side into position, before a pass out to Brown allowed him to drop a cleverly weighted kick in behind the Exeter defensive line, the fruits of which were lapped up by Earle as he claimed his second of the night. Lang obliged with the additional two points, but that would be the home playmaker’s last meaningful contribution as he departed the field just minutes later, attempting to halt Exeter as they hit back almost immediately with their third try of the contest. With referee Tempest growing increasingly inpatient with not only the home indiscretions, but also their incessant back chat, it was from another kick to the corner that the Chiefs pounced. A well-worked, off-the-top move was worked into the path of replacement Devoto - and the centre did the rest with a powerful turn of speed and a dominant leg drive that took him to the line. The officials wanted clarification, not just about the validity of the score, but also the home claims of two balls being in play in the build-up to the score.A number of reviews followed, both of which ruled in favour of the Chiefs, who moved to within a point again when Gareth Steenson slotted the conversion. But no sooner has the table-toppers got themselves back in the fight, another weak penalty - this time against Whitten for not rolling away - allowed Smith the chance to edge Harlequins a little further clearer with just over ten minutes remaining. The home fans were now in full voice and sensing a notable scalp was on the cards. 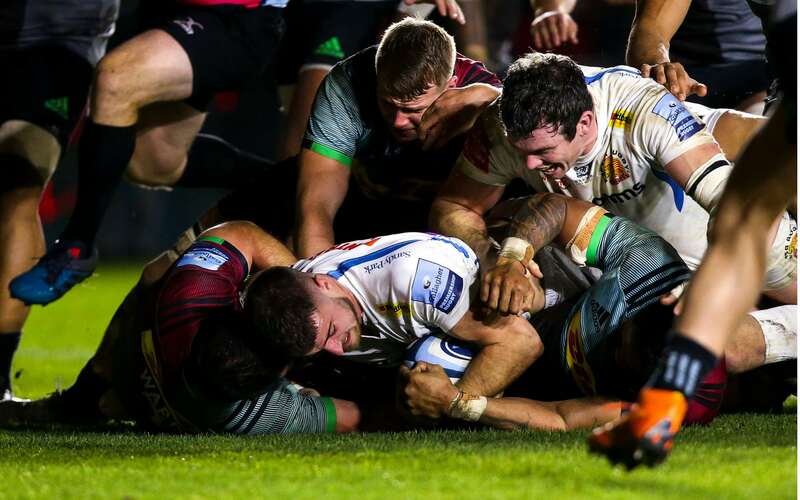 Four points up, soon became nine when, with the game into it’s dying embers, Harlequins landed a decisive and all-important bonus point score when Care put in a delightful grubber kick that allowed Marchant the easiest of touchdowns. Although the score went unconverted, Harlequins were in pole position and racing towards the finish line. The good thing about the Chiefs, however, is they never throw in the towel and looking at ending the contest without a point for the first time since December 2014, they were thrown a points lifeline courtesy of Smith. Looking to close out the gap by working his team-mates from side to side, the young fly-half failed to spot Whitten lurking in midfield and as he flung his pass to the left, the Irishman saw his moment, picking the ball from the night sky and winning the foot race to the line.Steenson again obliged with the conversion to set-up a potential grandstand finale. However, unlike at Ashton Gate a fortnight ago, this time there was to be no last-gasp heroics, Harlequins pressurising from the restart to force a knock-on - and a scrum - which they eeked out long enough for the clock to go red, before Care punted the ball to the sidelines. With their unbeaten tag gone, the Chiefs will now regroup ahead of crucial European weekends against Gloucester, where they must quickly rediscover their winning formula if they are to keep pace with those at the top of Pool Two.